I realize I’m a few days late getting this posted but it was a great event! Last Thursday was the Riverfront Park 2011 Homeowner Kick-Off Party. Siri Sellers, head of concierge for the neighborhood and I hosted a party celebrating the New Year. 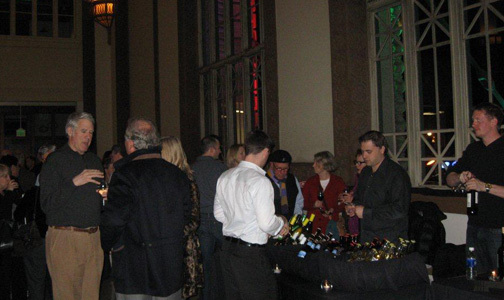 The party was held in the main train hall of Union Station on the mezzanine level and about 150 neighborhood residents joined us. It was a great night with much conversation about the current market and the redevelopment of Union Station. We had delicious food from Zengo and beverages from Little Raven Vineyards. The party was sponsored by the Riverfront Park Community Foundation. Each time a property is transferred within the community, a .5% assessment is made to this foundation. This money funds several different non-profit organizations but also goes towards making the Riverfront Park Neighborhood a better place to live. The Riverfront Park Community Foundation sponsors several different homeowner events throughout the year and we are looking forward to our next event, the annual ski trip! One of the best things about living in Riverfront Park is the incredible community. The different events and socials help make this a tight-knit community and there is something for everyone. I can honestly say, you would love living here!